Thread: Building a new Tige. I believe the price on the site, will be Tige's MSRP. I also think is does not include trailer, as its just another option. A dealer can discount if they choose. Here’s an R23 that was at the Dallas boat show this past summer. speaking as someone who ended up with a crappy trailer it's a good move for tige to include boatmate trailers. my 22ve came on a metalcraft trailer sourced out of slc utah for the tige dealer in idaho falls. trailer was a real POS. drum brakes, no reverse lockout wired and axles/lower parts were rusting at year 2-powdercoating flaking off. ended up back in utah living and when I talked to them they blamed it on me. offered to fix powdercoating for a grand- saying they were splitting the cost with me. 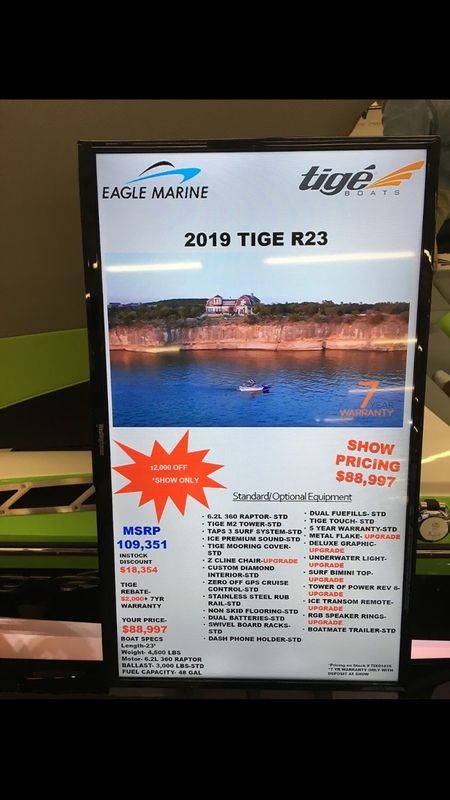 I get burn's points however tige sourcing trailers ensures they have some control over what their boats sit on as the trailer really is an extension of the boat. keeps dealers from buying a cutrate trailer and a few years from now looks like crap. people see that and associate tige with the trailer it's sitting on. It also adds to the deal for those who dont need/want trailer as they fry dock or wet slip. Cant say I disagree with you here Burn. And yes, every boat on the builder should show a base trailer as part of the price, its also all MSRP.